This is one of my favorite methods for making fish. It is a light, healthy and quite simple recipe. The packets can be made a few hours in advance and there is minimal cleaning up to do after dinner. I've made Fish en Papillote many ways throughout the years, but I really love the flavors and simplicity of this version. This pairs well with a salad, rice or quinoa. The simple cooking liquid that is used within the packet is, also, amazing for drizzling atop the fish after cooking. So, I always reserve a little for time of service. The liquid not only adds a huge bolt of fresh flavor and brightness to this recipe, but it keeps the fish ultra moist (no oil or butter is even needed in this recipe). The concept here is simple. 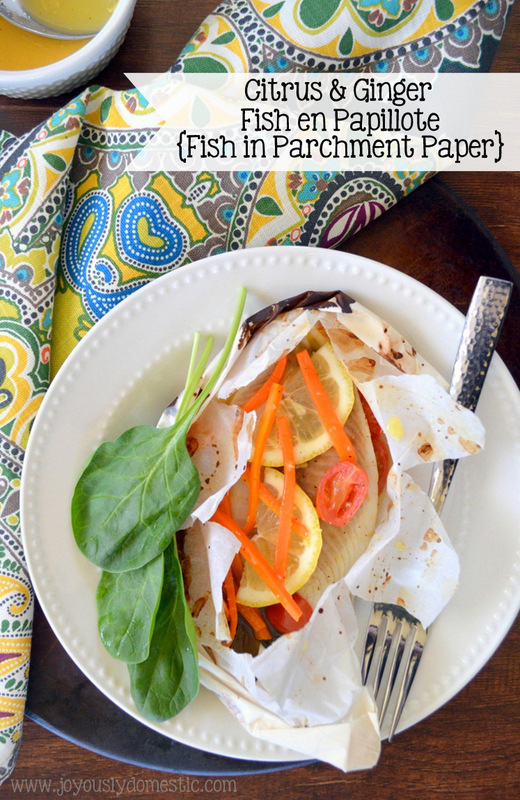 Stack up the veggies and fish on top of a piece of parchment paper. Add in a little of the citrus and ginger liquid. Seal tightly and bake. My children love that these are individualized ... so they can help make their own packets. Combine the first six ingredients in a small bowl. Set aside. Divide spinach between the four pieces of parchment. Place one piece of fish onto each bed of spinach. Season fish with salt and pepper. Fan out 2 - 3 lemon slices onto each piece of fish. Divide the carrots between the four packets. Add the tomatoes - eight halves per packet. Fold the empty half of parchment paper over the fish and vegetables. To seal, tightly roll the edges in 1/4-inch folds (around the edges) towards the fish to ensure no juices leak out while cooking. Tuck any remaining parchment "tips" up under the packet after folding. Place the packets onto a large sheet pan. Bake for 18 - 20 minutes or until fish is cooked through. Being careful of the hot stream, tear or cut into the parchment packets at time of service. Serve reserved citrus and ginger liquid with cooked packets. This looks delicious! Love fish. Adding it to my grocery list. Going to try it tthis week.